1.Preheat oven to 350°; line rimmed baking pan with aluminum foil. Place sausage on prepared pan; bake 20 minutes or until browned, turning once. Cool and slice. 2.In small saucepot, heat oil and garlic over medium-low heat 5 minutes being careful not to let it brown, stirring occasionally. Remove from heat; stir in oregano and crushed red pepper. 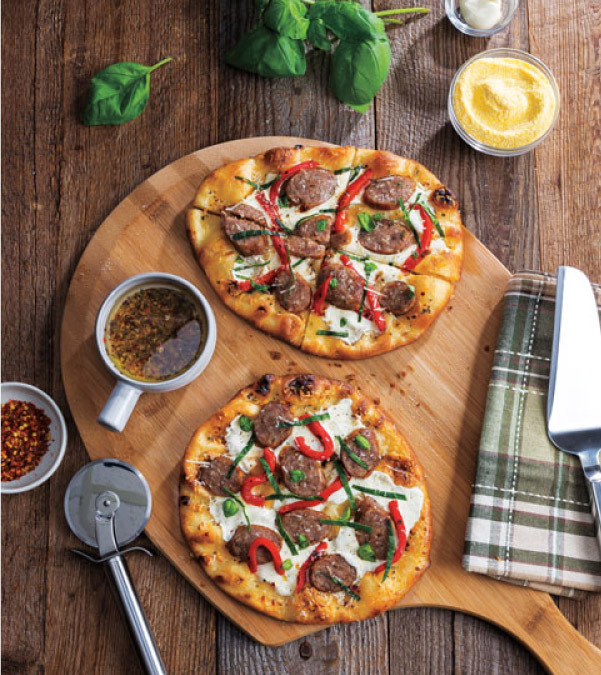 3.Brush top of each naan with oil mixture; evenly top each with mozzarella cheese, roasted red pepper and sausage. Evenly sprinkle each naan with salt and 1/4 cup Parmesan cheese. 4.Place pizzas directly on oven rack; bake 10 minutes. Sprinkle pizzas with spinach, basil and remaining 1/4 cup Parmesan cheese. > To grill sausage and pizza, prepare an outdoor grill for direct grilling over medium-low heat. Grill sausage, covered, 15 minutes or until cooked through and browned. Increase heat to medium-high; grill pizzas, covered, 5 minutes or until bottoms are browned, rotating pizzas occasionally.